Apr. 16 (NBD) -- Many were often seen handing over more than 20,000 yuan (2,980.8 U.S. dollars) for one luxury handbag or one top-of-the-line MacBook Pro. 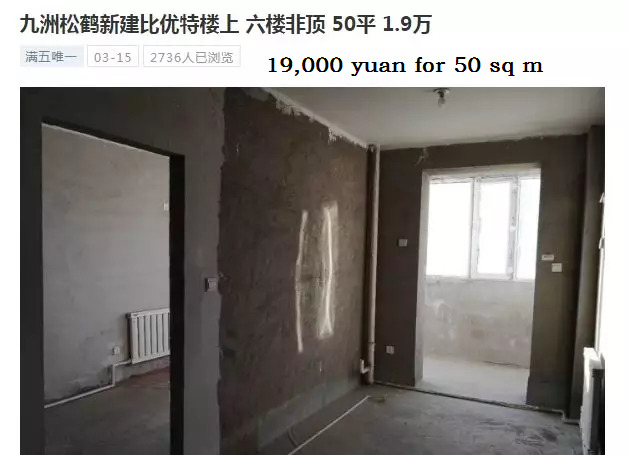 But you cannot imagine for that price, you can buy a house (yes, a house, you didn't read it wrong) in the city of Hegang, northeastern China's Heilongjiang province. 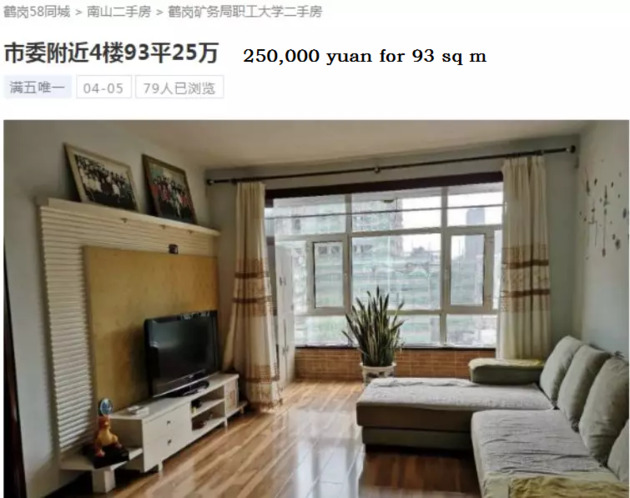 A screenshot that has gone viral on the Internet shows a 55-square-meter apartment in the prefecture-level city costs only 19,000 yuan (2,831.7 U.S. dollars), a price that you cannot buy a single square meter in the country's traditional and emerging first-tier cities. Around five-hour drive from provincial capital Harbin, Hegang once experienced flourishing development thanks to its abundant coal resources, but gradually lost its luster due to resource depletion and single industrial structure. Housings priced at about 20,000 yuan can be easily found on second-hand house trading platforms. From pictures posted, it can be seen many of them are situated in a great location, supported by a complete set of supportive facilities. However, through talks with local realtors, NBD found these houses are mostly on the 6th or 7th floor and do not come equipped with elevators. More importantly, they are revamped shantytown houses and buyers might have to wait for years to get the property ownership certificates. For commercial houses at the downtown area, the price stands at around 2,000 yuan per square meter on average, also surprisingly low when compared with surrounding cities like Kiamusze and Yichun. The gloomy housing market is a natural outcome of the sluggish economic growth and population decline. In the past decade, approximately 100,000 people left the once-prosperous city. Yan Yuejin, research director at E-house China R&D Institute, said to NBD that the population outflow will definitely lead to a floundering housing market. To cities that used to rely heavily on coal resources and heavy industries, such as Hegang, the priority is to foster new industries and come up with measures like launching high-speed railway lines to attract population back. Only so, can it offer a new impetus to the housing industry, Yan added.